Successfully Added LED Headlamp - 800 Lumens, Waterproof, CREE XM-L T6 LED, 18650 Battery to your Shopping Cart. No matter what purpose you are using it for, this lightweight and extremely powerful LED headlamp is guaranteed to live up to your expectations. 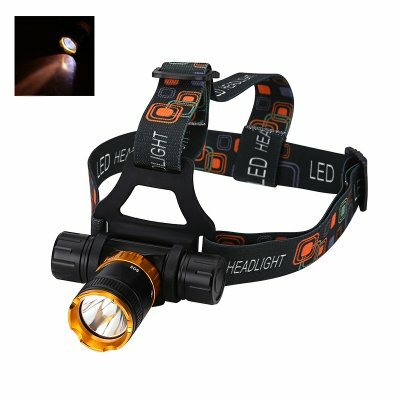 Constructed from an extremely durable aluminum alloy, this lightweight LED headlight is the perfect tool to have with you when hiking, climbing, camping, or cycling. The high quality elastic headband is easily adjustable and conveniently fits on your head, lighting up whatever is in front of you. Being water proof up to 20 meters - this durable headlight can hold up to the rigors of everyday use and more. This powerful headlight comes equipped with a CREE XM-L T6 LED, outputting a massive 800 lumens with a maximum beam distance of up to 300 meters. The head lamp can be used in 5 different modes, simply switch between them by using the easily reachable and smooth to operate twist switch located on the lamp itself. Not only does this light give you three different brightness’s to choose from, it also comes along with a ''strobe'' and SOS mode to make sure you can alert people in your near surroundings when ever you need assistance. Powering this headlight is a single 18650 battery (not included) that is easily replaceable. Secured by two high quality o-rings the device is water proof up to a dept of 20 meters. Although not designed for excessive submersible usage you do not have to be afraid of using this device on short scuba-trips nor will there be any chance that extreme weather conditions may have a negative effect on this high-end LED headlamp. This LED headlight comes with a 12 months warranty brought to you by the leader in electronic devices as well as wholesale LED lights, Chinavasion..
Use For: Scuba Diving, Hiking, Camping, Hunting, Daily Carrying, Night Ride, Caving, etc.